eval.in is a really cool website that lets you run source code under a variety of interpreters. I’ve always found the idea of sandboxes fascinating, so I tried to figure out how it’s built. After some reading, I ended up building my own sandbox system, Minival. What you are reading right now is the commented source for this sandbox, which also serve as a tutorial of sorts about sandboxing. You shouldn’t need to have more than some passing knowledge of C and UNIX syscalls to understand this tutorial, so let’s jump right in! we could use a language feature to limit what 3rd-party code can do (rpython or Safe PERL are examples of this). we could ask the operating system to restrict what the program can do. It’s hard to break out of a sandbox if the OS kills the process whenever it tries to do an I/O operation. we could do some complicated static analysis of the code. Google’s NaCL uses this approach. 1/ is hard to implement because we’d have to think through every possible way people could use Python to break out of the sandbox. 3/ would require an expertise about assembly and binary that I don’t have. That leaves us with 2/ – using OS primitives to somehow constrain processes. 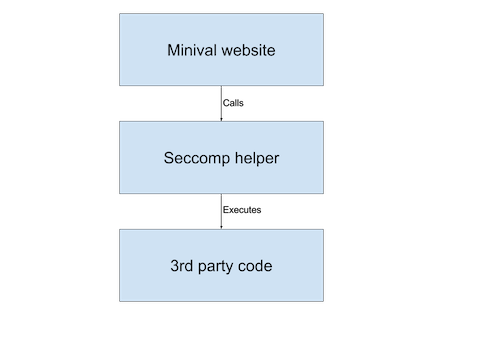 use seccomp(2), a Linux-only system call that lets a process define a whitelist of system calls it’s allowed to make. Ptrace seems fine – I heard that that’s what eval.in uses - but it would be a little annoying to implement in Python. It also has a non-negligible performance hit. Seccomp is a little more interesting. It was created back in 2005 to let people rent out their CPU (!). Over the years it added the ability to define pretty fine-grained rules that the kernel will use to limit access to resources. Seccomp seemed a bit better at the time, even though it didn’t really have a good Python interface, so I ended up writing everything in C.
The helper will setup some helpful limits and then call execve(2) to run a Python or PERL process. Once the limits are set, the 3rd-party code is effectively restricted to the whitelist of syscalls we defined. First, we have to setup some CPU and memory limits. We use the setrlimit(2) syscall for that. We have to do this before setting up the sandbox because we do not want people to be able to change them after that the sandbox is running. Limit the maximum CPU time of the process to 10 seconds. Let’s also limit stack and heap usage to 16MB. Setup seccomp. SCMP_ACT_KILL tells the kernel to kill processes when they make a forbidden syscall. Let’s whitelist a bunch of syscalls. We do this by calling seccomp_rule_add with some parameters to match syscalls. Note that I got this list mostly by trial and error; I had to run strace on the python interpreter to see which syscalls it was making. Astute readers may have noted that we haven’t whitelisted the open(2) syscall yet. This is because we want to prevent people from creating files. To do that, we’ll only whitelist and handful of parameters: O_RDONLY, O_CLOEXEC, O_NONBLOCK, O_DIRECTORY. Because the parameters are ORed together, we have to do this on three separate lines. Python also tries to make so local socket connections when starting – so let’s open up sockets but only if they’re local. Next are two one-off rules for PERL. We also need to prevent people from writing to any files on the file system besides stdin, stdout and stderr. To do that, we let people write to file descriptors 0, 1 and 2, since on UNIX they’re the default values for stdin, stdout and sterr. Now, let’s load the filter! Note that it’s critical to check the error code of this function, because we do not want to be running untrusted code because the filter wasn’t created! We can now let the Python or PERL interpreters run the program safely! So, that’s about it! As you can see, it was really easy to create a secure environment for our use case. If we had wanted to go the extra mile, we could have used something like Linux namespaces to provide separate file systems, networking, etc. to the sandboxed code – which is actually what LXC and Docker do to implement containers! Of course, please let me know if you have questions or remarks (especially if you’ve found a security issue in the above code!) – send me an email at hello at khamidou.com!